Combine the gin, syrup and lemon juice. 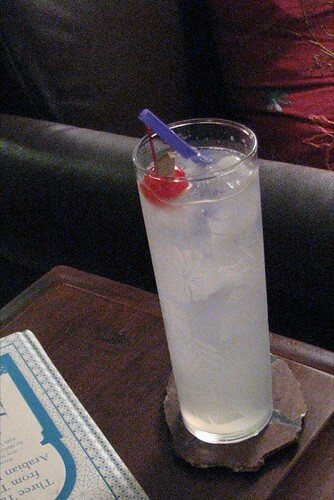 Shake and strain into a tall collins glass with ice. Top up with seltzer and garnish with a cherry and an orange slice. So, a couple of notes… The book recomends club soda. Personally, I never touch the stuff; it’s like drinking baking soda, so the soda siphon is the way to go. Also, oranges aren’t in season right now, so in spite of the fact that we live in the land of oranges, they look like crap and cost more than a forclosed house, so no on the orange slice right now. Finally, we both though that the drink was a bit sweet, so I think in future we would put in 3/4 oz. syrup and 1 oz. lemon juice. What’s the conclusion? It really is a refreshing bit of summer, and we agree… It is better than a gin and tonic. Now if you’ll excuse me, I am going to go concentrate on sweating. How could I possible forget anything uttered by she-whose-wisdom-and-condescension-I-crave? Oh, and you really should get that cough looked at.